Got out for an overnighter with Dave last weekend. 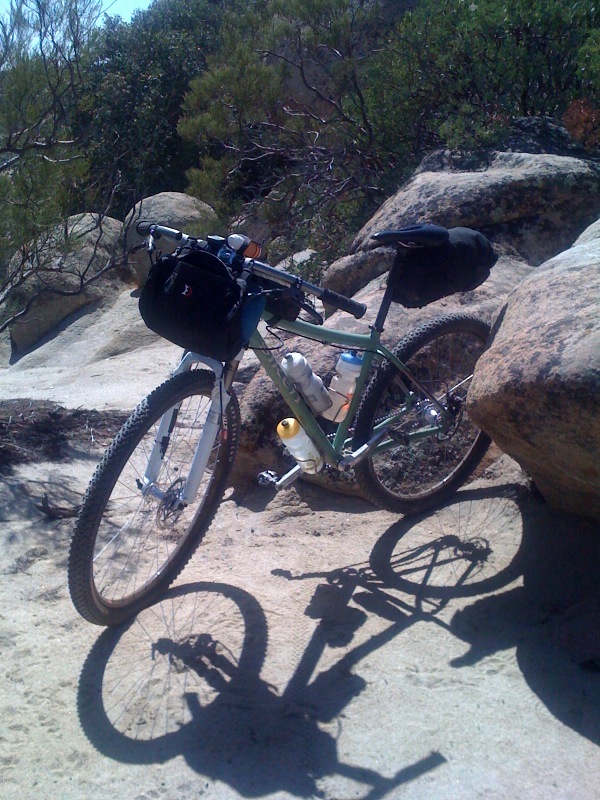 Idyllwild to Noble Canyon (San Diego) with as much dirt as we could find, about 120 miles total. I took some notes on my gear & goody list, and realized most of these are kept under lock & key. Well, here’s mine for all to see. Not saying it’s my end-all kit, but I’ve been working on it and will continue to make improvements. 1 pair undies. Boxers not briefs. Gel flask, loaded full of maltodextrin goodness. more esbit cubes, maybe 2.5 per day? Good stuff Brendan. Care to elaborate more specifically on “watch wheel tension/ tire pressure with loads?” Thoughts on at what weight/location of weight and what corresponding adjustment to pressure/tension? Great list. Would you be interested in posting it over in the “personal setups” section of bikepacking.net? I think others would find it interesting. Noble Canyon is a fun trail. Cool that you linked it into a bikepack trip. Brian- that was something of a note-to-self, but it could be relevant to anyone. I’d recently rebuilt my wheels and the tension was a bit low. I could really feel it in the tighter turns. I don’t use (or own) a spoke tension checker, but it would be useful. Also in that vein: Tire pressure and shock pressure. I raise all of them slightly for a given condition when I’m loaded with more suspended weight. You’ll really notice it on your Song, too. Scott- I cut-and-paste most of this into the Bikepacking.net space. I hadn’t even thought of it for some reason. And, yes, Noble Canyon is legit. It was my first run down that trail and I hope to return soon sans gear. nice. I am planning a little 300 mile adventure for the memorial day weekend – mostly offroad. great post for me. I have been really trying to dial in what I am, and what I am not taking. love the frame bag. Hey Jruss, can’t wait to see what your 300 miler turns out to be… I’ve got to imagine you’ve got a lot of great options out there in SW Utah. I’ve got a 300 miler of my own coming up… yikes!